My sis says everything a person can’t see at my house is so organized. My cousin Sandy says everything about me is disorganized, including the things a person can’t see. My friend Cheryl says there is always hope; at least she hopes there is hope because she is a lot like me in the disorganization department. My friend Bert has quit coming by to help because, well, it just never seemed to improve matters. My friend from Texas, Terry, says she will most definitely come to visit but she is not doing any dishes. Nor is my friend Kay. … and seriously considering cleaning house next week. Before it starts looking like this! For more photos like these click here. OMG!!!! I have NEVER seen your house like this!!!! 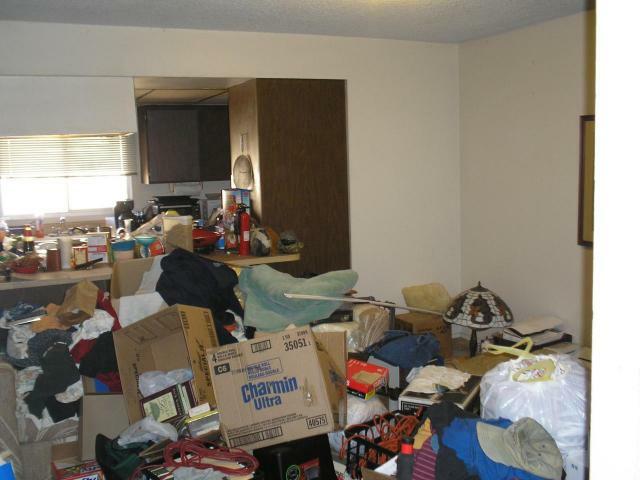 I think I will bookmark this myself just for the sole purpose of saying “At least my house doesn’t look like this!!!! !” HAHAHA!!!! I told you there was hope!!!! Gotta love ya!!!! We are not hoarders…….we are living life and enjoying what matters most……spending time with family and friends making good memories that will last a lifetime!!! No one is going to remember us for our clean or cluttered houses only that we were their for them when they needed us the most!!!!!! Well, said, Cheryl. It may be a little dusty around here and the dust bunnies might be hopping around a bit and I may have to move my stacks of papers off the kitchen table (where I have placed them to organize them I might add) but we are not missing those good moments in life where we reach out our helping hands or hold out our hugging arms. I really, truly am thinking about catching me a dust bunny or two this week, though. I am the Queen of organized chaos! Good luck, B.
I like that nomenclature better. Organized Chaos!